When Sally Strathdee checks on birthing ewes and newborn Valais Blacknose lambs, she doesn’t have to get up close to know whether she’s got boys or girls. 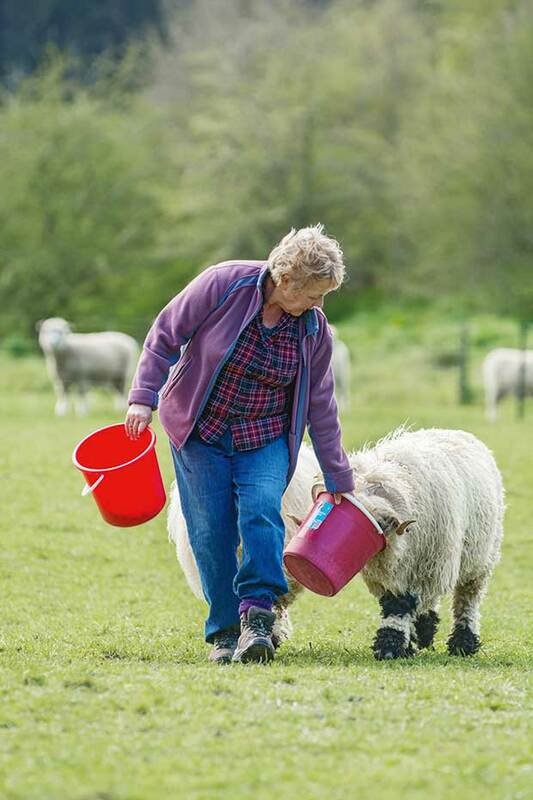 If you’d asked Sally about the undercarriage of sheep a few years ago, the long-time Christchurch midwife wouldn’t have been able to tell you much. She and financial advisor husband Lindsay were living in town and thinking it was probably too late to fulfil their dream of a country life. But two life-changing moments were about to shake things up. The first was the 2011 Christchurch earthquake, which eventually left them with a good pay-out for their red zoned home and its ruined foundations. 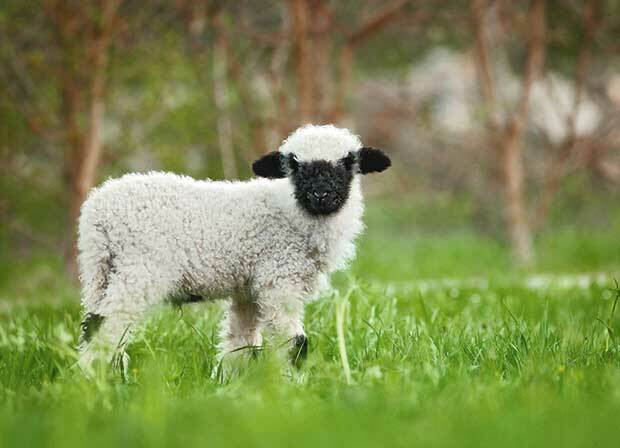 The second came when Sally was scrolling through the internet one night and saw the cutest sheep in the world. The Valais Blacknose had claimed another fan. 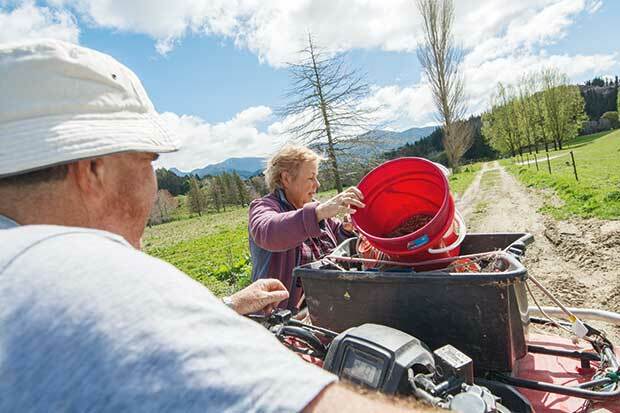 The couple were so smitten, they decided to use their pay-out to go farm shopping. 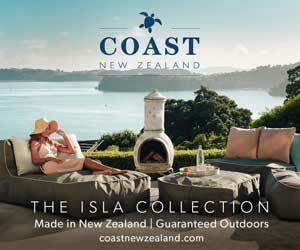 They liked the Motueka area, but couldn’t find a property that suited their criteria. Lindsay finally decided he’d just ask everyone. 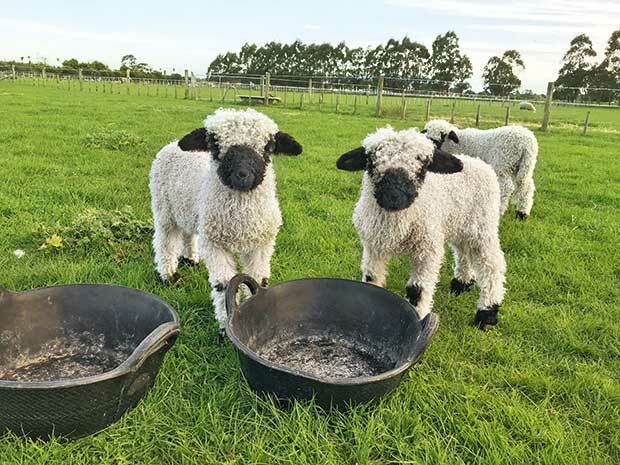 It would be five years from the time Sally first fell in love with a picture of a Valais Blacknose sheep, to the day this photo of her twin ewe lambs and a friend went viral. The couple went to see it, agreeing to play it cool. To get the cutest sheep in the world would prove to be far harder and take much longer. 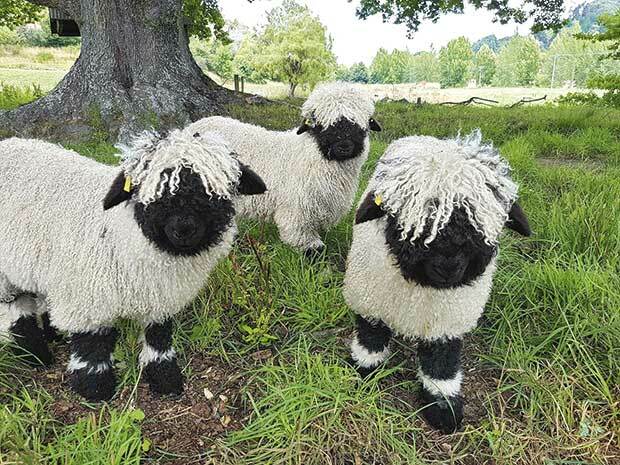 Valais Blacknose sheep are native to Switzerland, but it’s currently not possible to buy sheep from there. The Valais live high in the alps in the shadow of the Matterhorn. There are no specialist facilities to oversee sheep exports, and not much interest in selling by Swiss breeders. 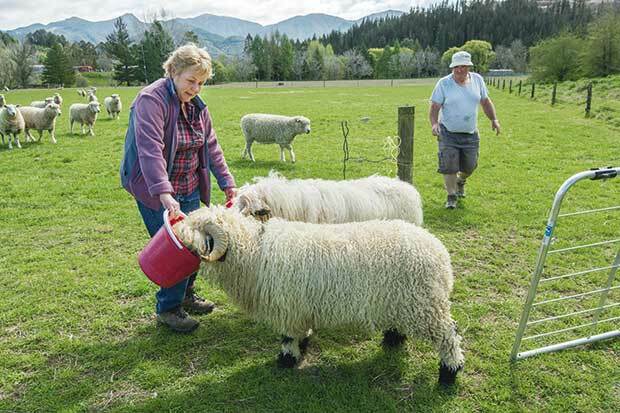 Christine Reed helped navigate the tricky task of importing the Valais into New Zealand. Fortunately, Lindsay knew just the right woman. 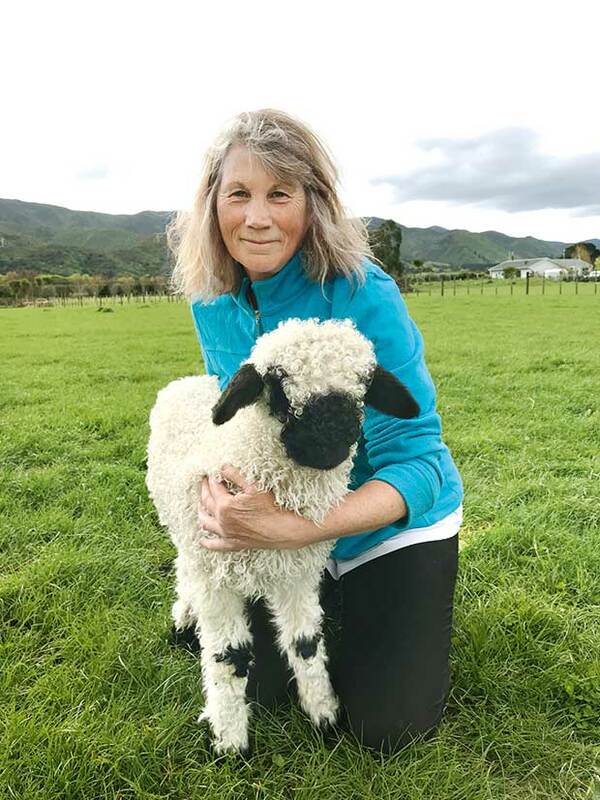 Christine Reed is a long-time Wairarapa block owner, who has bred rare sheep (Dorper, Jacob, English Leicester), horses (Hanoverian), and cattle (white Galloway). The bonus: her work is managing scientists and veterinarians who provide animal health and plant advice to the Ministry for Primary Industries. MPI is the Government department which oversees the importation of livestock and animal genetics into NZ. Lindsay sent her a photo. Getting them into NZ would be one of her biggest. When they first looked at importing Valais, back in 2014, it wasn’t possible to import embryos or live animals from anywhere. That was mostly to protect NZ’s status as one of the few places in the world that is free of an untreatable, fatal, degenerative disease called scrapie which affects the central nervous system of sheep and goats. Valais sheep are natives of Switzerland, living high in the alps. But the tough stance was under review by MPI, thanks to the fledgling milking sheep industry in NZ, which needed better genetics to improve its flocks. MPI’s new import health standards have specific testing and quarantine requirements for scrapie and a number of other diseases in the UK that are not in NZ. If embryos can pass the strict criteria, they can be imported into NZ. 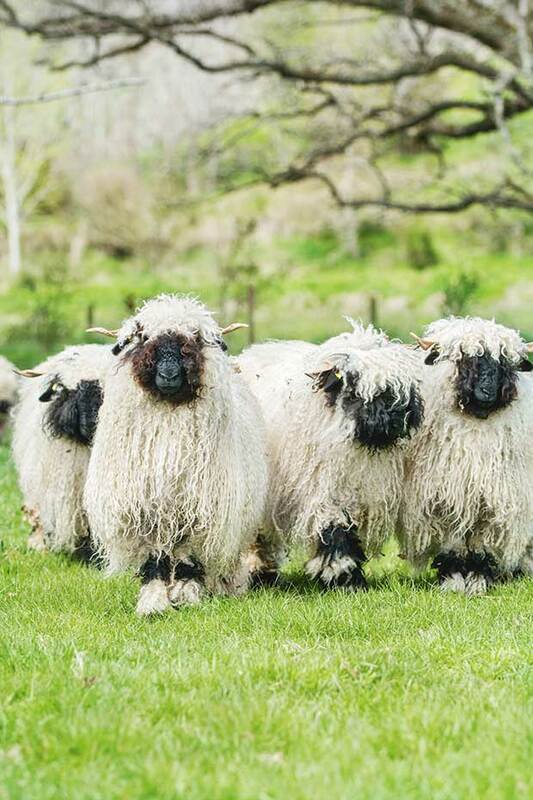 In 2016, as MPI was finalising the new standards, Christine travelled to the first-ever National Valais Blacknose Show in Carlisle, UK. She wanted to check where she could source the best stock, and to see for herself just how cute these sheep were. It turned out, even cuter than their pictures. One of Sally and Lindsay’s purebred Valais, with companion ewe Wombat. Sally and Lindsay spent the time preparing their farm for the new venture. Their land starts as a flat plain, rolls up gentle slopes, then becomes steep hills, covered in regenerating bush. The couple has put QE2 covenants in place to protect them forever. Valais Blacknose are naturally friendly, curious sheep, but food treats are always appreciated. The couple took 18 years to do a DIY renovation of their old villa in Christchurch. They decided they were, “too old to muck around this time,” says Lindsay. 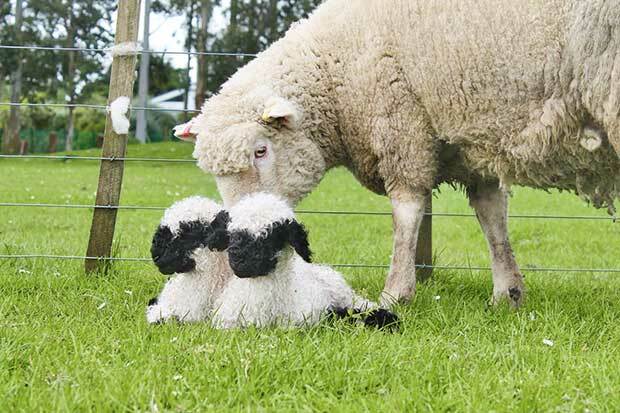 They also had to find the right mothers – technically known as recipients – that would carry the valuable Valais Blacknose embryos. 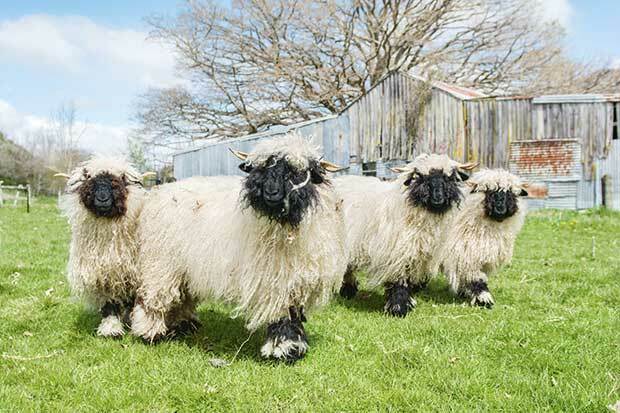 The process of getting Valais Blacknose embryos into NZ ewes started half a world away on farms in the north of Scotland, and in Northumberland, in the north of England. It was a risk for everyone at every step. Scottish breeders Raymond Irvine and partner Jenni McAllister, and English breeder Jamie Woods had to pay to have their ewes tested to prove their disease-free status. Their ewes went through a medical process to ‘flush’ out embryos. All the work was done by specialist vets from an approved export facility in Edinburgh, to meet NZ’s strict import standards. What sounds simple took a lot of time, liaising, paperwork, quite a bit of sweat, and more paperwork. There was a risk of failure at multiple points throughout the process. Once they were in NZ, the stress continued. Some of the embryos were sent to a facility in Christchurch for implantation into Lindsay and Sally’s recipients. Others were sent to Christine’s technician for implantation into her Poll Dorset recipient ewes. The recipient ewes have hormone implants inserted into them in the weeks beforehand. This ensures that a technician can implant the embryos inside the ewes at the correct point in their cycle, and all on the same day. There are expensive, risky decisions to make about implantation. “There are two schools of thought,” says Sally. “If you implant twins, there’s an increase in the pregnancy hormone which helps hold onto the pregnancy. However, if she aborts, you lose two lambs. But with all the science and human interference in the process, nature still had a little surprise for everyone, five months later. The result is, between them, Christine, Sally and Lindsay have a flock of 50 purebred Valais running around their blocks. That brings the total in NZ to 130-150 purebred Valais, the rest born from embryos imported by other syndicates and individuals. There is a serious business plan behind their investment. 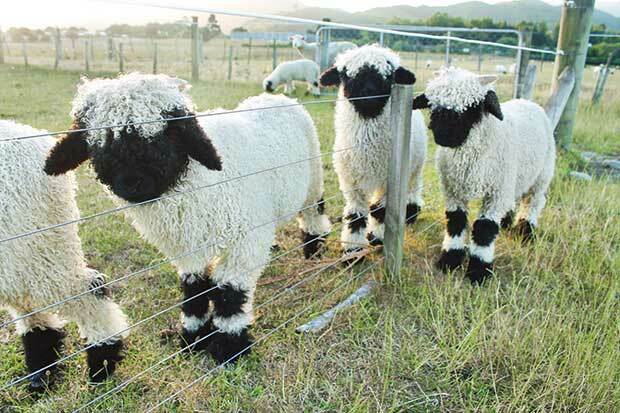 Lindsay, Sally, and Christine have formed a company, Valais Blacknose Breeders NZ. “Unless you’re a millionaire, you can’t just raise cute sheep,” says Sally. “You’ve got to be able to get money out of it somewhere, or you go under. “By the time you sit down and cost it all out, if you’re lucky to get a 60 percent success rate, you pay $2000 each for the embryos. That’s off-farm, before they get here (to NZ). A recipient Poll Dorset ewe with two of Christine’s purebred Valais Blacknose lambs. 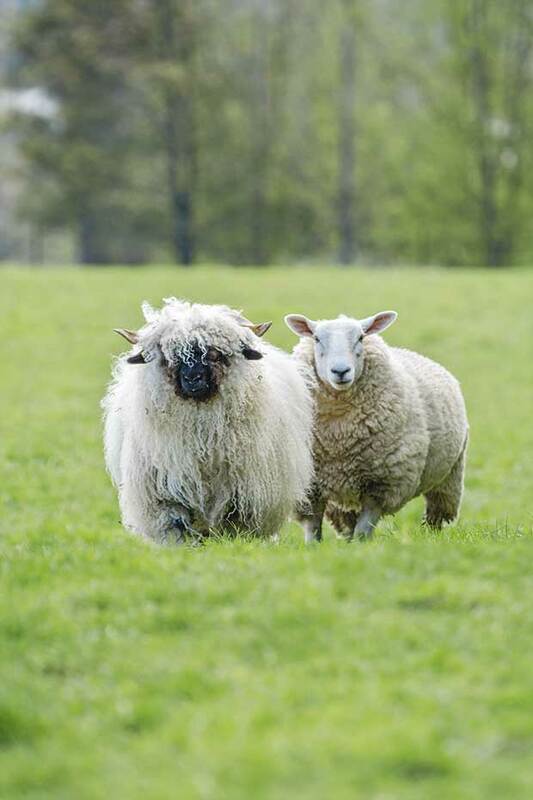 To help people who can’t afford to start with purebred stock, they are selling Valais-English Leicester crosses, which can be bred up to pedigree status over several generations. 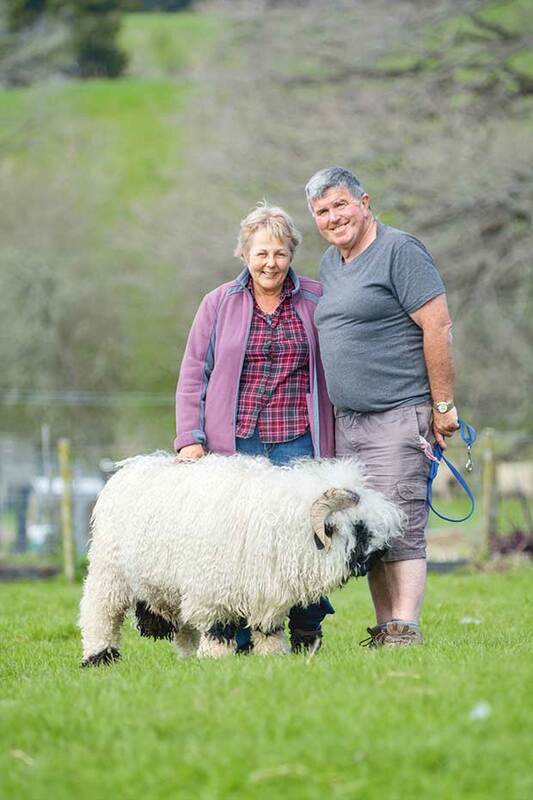 Sally, Lindsay, and Christine helped to create a breed society with other NZ owners of Valais, to ensure there was a registry and an official process to follow. They have sourced several bloodlines from the UK to ensure anyone breeding up can get the rams they need to achieve pedigree status after five generations. In 2018, they bought the top ram and two top grade ewes in the UK at the national show. These sheep are staying with Raymond and Jenni in Scotland and will be used to provide more genetics. However, the big business opportunities lie in the USA. NZ sheep have a huge advantage thanks to this country’s lack of many of the serious animal diseases that affect the rest of the world, says Christine. That gives breeders here export options not available to other countries, and US Valais Blacknose fans are screaming out for new genetics. To import Valais from the UK to the USA, sheep must carry a particular genotype which is resistant to scrapie. But the Valais with that genotype are not from purebred Swiss bloodlines, says Christine. She says that’s the market advantage. Their US business associate, Wendy Artz, is already flooded with requests. When a story on Valais sheep in NZ ran on US TV, things went crazy, says Lindsay. What started out as a quest to get some cute sheep has been an enormous effort, but worth it, says Christine. Sally and Lindsay agree. They are now promoting ‘breakfast with the Valais’, where people can stay as guests in their cottage and enjoy breakfast with cute, curious sheep looking on. Sally says it’s the type of farming that soothes her townie soul. 1. They may look small and cute, but Christine says everyone is surprised at just how big the animals are in real life. 2. The breed has been mentioned in the Swiss Alps since the 1400s, but was only officially recognised with its own breed standard in the 1960s. 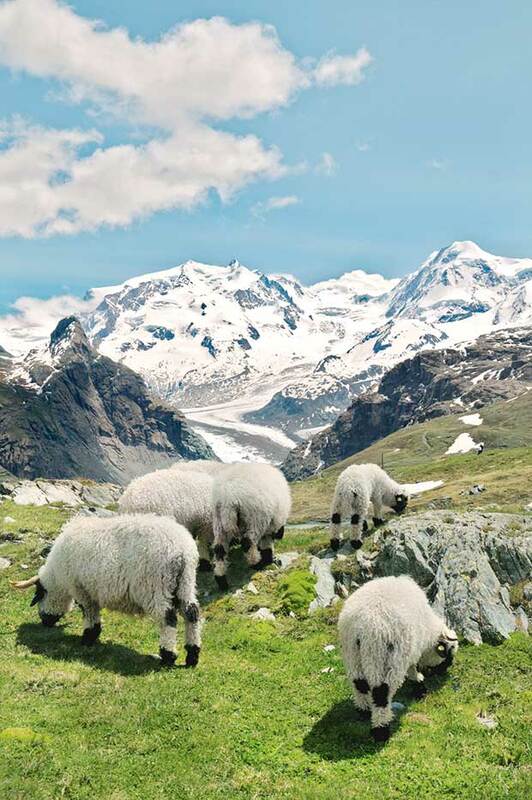 In Switzerland, the Valais are used for wool and prized for their lean meat. 3. The colouring on a Valais is quite specific. All the spots must be in the right place on the knees and hocks. Females have black bottom spots, and both sexes need the right amount of black on their face. 4. Most sheep breeds are suspicious by nature, and it usually takes a lot of familiarity and food bribes to tame them. The Valais have a temperament more like dogs, with a natural curiosity about humans, says Sally. “There are lovely YouTube clips of hikers up in the Alps, eating their lunch, and all of a sudden there are Valais lined up in a semi-circle, gawking at them. “They don’t like being on their own, they like being with you, and each other. They’re quite trainable as well because they’ve got that gentle nature. 5. Valais grow up to 30cm (4kg) of fleece and need to be shorn twice a year. The wool is thick (38 microns) compared to the best quality wool sheep breeds, like the Merino (13-15 micron). However, the curls in the fleece are highly prized for felting, as the wool takes dye well, and retains its shape. It means crafters can use it to create lampshades and containers.